Open-Scholar at the CERN Workshop on Innovations in Scholarly Communication (OA18) – Open Scholar C.I.C. Pandelis Perakakis and Michael Taylor presented a poster on the LIBRE concept at the OA18 CERN Workshop that took place in the University of Geneva between the 19th-21st of June, 2013. The poster was well received, particularly by colleagues in the community who are managing university or institutional green open access repositories. 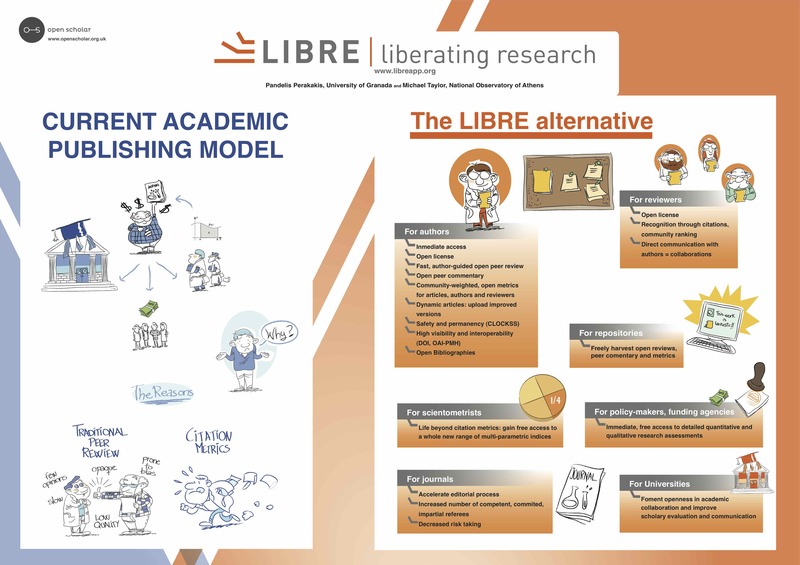 Another positive trend was that several editors of academic journals also agreed that LIBRE could potentially help speed up their own peer review process. open annotations — open source codes like Pundit were introduced that enable comments to be linked via metadata tags to online objects like books, articles and images. there is an exponential uptake by scholar of Twitter as a mode of instantly commenting on published material. the quality or impact of articles and scholars ideally should be assessed on a case by case basis by experts. the sharing of data can help pave the way toward virtual observatories that will help researchers search, access and share data more efficiently – the stunning example of data handling at CERN was provided by Tim Smith in the context of “Big Data”. there are signs that scholars are beginning to engage in online academic review more publicly. gold open access journals should mimic green open access infrastructures. that quips such as “going for gold”, “the winner takes all” or “one man’s threat is another man’s opportunity” in powerpoint presentations and comments by the speakers – were signs that gold open access is just an oxymoron for an attempt at exploiting (green) open access. publishers including PLOS, Copernicus, MacMillan, and Reed-Elsevier. blog CERN Workshop, LIBRE, Open Access, Open Scholar. permalink.